There are a number of improvements to the HttpSecurity.oauth2Login() DSL. We’ve introduced the SecurityTokenRepository<T extends SecurityToken> abstraction, which is responsible for the persistence of SecurityToken 's. The initial implementation InMemoryAccessTokenRepository provides the persistence of AccessToken 's. In an upcoming release we’ll also provide an implementation that supports the persistence of Refresh Token’s. A couple of minor improvements were introduced to the IdToken along with some final implementation details for JwtClaimAccessor, StandardClaimAccessor and IdTokenClaimAccessor, which provide convenient access to claims in their associated constructs, for example, Jwt, IdToken, UserInfo. We’ve added the capability for an AuthorizationRequestRepository to persist the Authorization Request to a Cookie. The current default implementation persists in the HttpSession, however, a custom implementation may be provided to persist to a Cookie instead. Support was also added for URI variables configured in the redirect-uri for the AuthorizationCodeRequestRedirectFilter. There were a couple of minor updates to the properties for configuring an OAuth 2.0 Client. The configuration below outlines the current structure. You will notice that there is support for configuring multiple clients, for example, google, github, okta, etc. A complete example for using the new Spring Security OAuth 2.0 / OpenID Connect 1.0 login feature can be found in the Spring Security samples at oauth2login. The guide will walk you through the steps for setting up the sample application for OAuth 2.0 login using an external OAuth 2.0 or OpenID Connect 1.0 Provider. The first step is to use @EnableReactiveMethodSecurity to enable support for @PreAuthorize and @PostAuthorize annotations. This step ensures that the objects are properly proxied. Spring Security’s WebFlux support will then ensure that the Reactor Context will be populated with the current user which is used to determine if access is granted or denied. 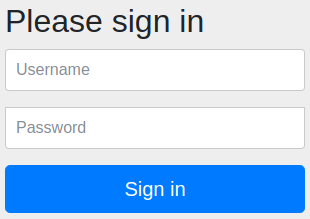 WebFlux security now supports form based log in and provides a default log in page to ease getting started. For example, the samples/javaconfig/hellowebflux[samples/javaconfig/hellowebflux allows users to authenticate using form based log in with a default log in page. We decided to make the default log in page link to an external CSS file to make it look nicer without needing to bundle CSS. What do you think? If you are not connected to the internet, the log in page falls back to an unstyled page. Of course, you can provide your own custom log in page as well. Similar to the servlet world, we have also added content negotiation support for WebFlux security. For example, when requesting a protected resource without being authenticated our minimal example from WebFlux Form Log In will produce a log in page in a web browser and a WWW-Authenticate response from a command line. Notice that the form based login has a SESSION cookie in the response, but HTTP Basic does not. This is done with a single HttpSecurity configuration (we are splitting the application into slices). If you have feedback on this release, I encourage you to reach out via StackOverflow, GitHub Issues, or via the comments section. You can also ping me @rob_winch or Joe @joe_grandja on Twitter.